A huge thank you from the Bristol FD’s for such an interesting, relevant and entertaining study day recently. The session had really great content, but it was your way of being with each other that made the day an outstanding role model of teamwork. You are both such relaxed and natural communicators and brought great humour and clarity to your subject. What an honour to spend a day with such leaders of our profession. Martyn and Sally manage to make a somewhat dry subject fun, excellent presentation skills from a smooth, professional team. Much more than 4 handed dentistry, understand the ergonomics of surgery layout, reduce work stress and save your backs. I only wish I’d known 20 years ago! “We work in a very busy general practice in the west of Ireland catering for routine and advanced restorative treatment including implants. We are constantly evaluating our systems and striving for more efficiency. 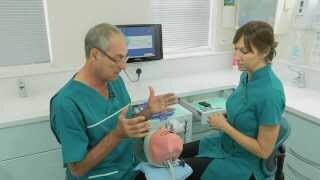 The knowledge and expertise that Martin and Sally brought to our practice was staggering. Their easy presentation style totally engaged our staff and we found we were able to implement most of the techniques the very next day with a huge improvement in efficiency and reduction in team stress. Thanks for a really splendid 4-Handed day for the Bristol FDs + nurses. You covered theoretical + practical aspects brilliantly and modelled a level of teamwork for us all to aspire to. As you saw the feedback forms were outstanding so I hope you would consider speaking to the group next year. Thank you once again for an inspirational, passionate account of what close support dentistry can achieve! A big thank you to you, and Sally, for a fantastic afternoon. Who can forget ‘Nurse in First!’ I would highly recommend this course to anyone wanting to save their back. Watching Martyn at work has been an education – and even as a layman and a patient I can see just how much more effective his delivery methods. As a business performance advisor to dentists for over 15 years I have been very careful to stay away from any observations on clinical effectiveness – keeping well away from things I don’t know or appreciate. Four-handed dentistry appears to be a no-brainer from where I’m standing. Bespoke training courses at your practise, we focus on the areas that will give you the most benefit. We will have the opportunity to observe you in your own working environment, and make suggestions that will generate immediate result. Martyn qualified in 1971 at UCH in London and went on to develop a large dental practice in the midlands of the UK. For the last 25 years he has been teaching internationally the concept of 4 handed dentistry and correct posture to dentists and nurses. Sally Chadwick has been a dental nurse for 34 years working with Martyn at his large practice in Banbury. For the last 25 years she has helped him run courses internationally on 4 handed dentistry and has published several articles in dental magazines.